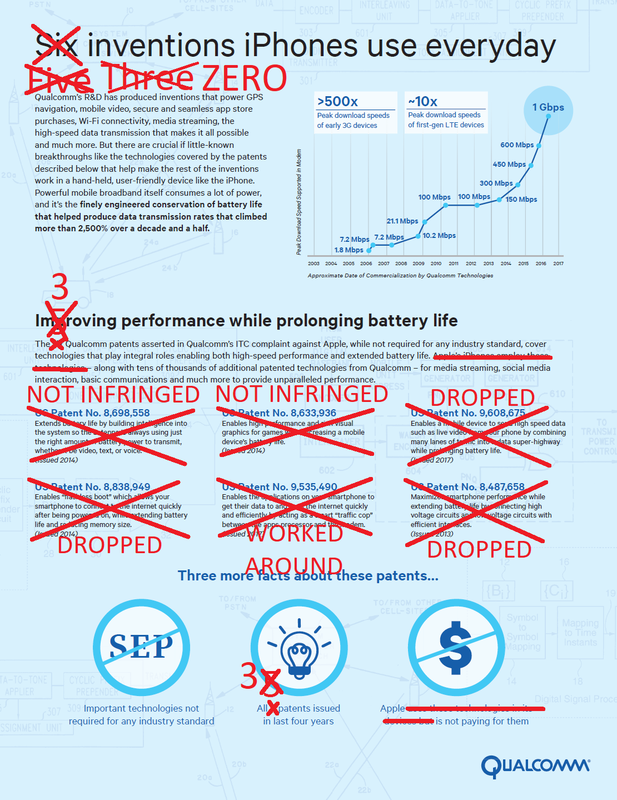 Qualcomm's patent enforcement campaign against Apple, which started in the spring of 2017, has produced some headlines but no real results. What Qualcomm wanted was to gain leverage over Apple well in advance of the Apple & contract manufacturers v. Qualcomm trial that will take place in San Diego in April. Qualcomm furthermore wanted to demonstrate the strength of its patent portfolio to the industry at large. But it has failed to achieve the former (practically zero leverage over Apple), and with respect to the latter, the very opposite is the case: the longer Qualcomm keeps litigating against Apple without real results, the less its royalty demands for non-standard-essential patents (a premium of 1.75% as Qualcomm charges 5% for its entire portfolio vs. 3.25% for only its standard-essential patents) will be accepted by the rest of the industry going forward. On Friday, Dr. Ron Katznelson, a former Professor of Electrical Engineering at the University of California in Qualcomm's home town of San Diego, told the United States International Trade Commission (USITC, or just ITC) in a public-interest statement that there are dozens of alternative technologies to the asserted claim 31 of U.S. Patent No. 9,535,490 on "power[-]saving techniques in computing devices." That's the one Qualcomm patent an Administrative Law Judge (ALJ) deemed Apple to infringe, though the ALJ recommended (for public-interest considerations) that no import ban be ordered. Dr. Katznelson was right. Qualcomm's sole remaining patent-in-suit in the investigation of its first ITC complaint against Apple is apparently as useful as having a fence on only one side of a property: anybody can just walk around it. "Qualcomm's presentation at the hearing crystallized its theories regarding the scope and coverage of claim 31 of the ’490 patent. Against that backdrop, Apple recently changed its software (i.e., iOS) to remove the functionality that Qualcomm has accused of infringing claim 31, by implementing a design change that Qualcomm's own witnesses conceded would fall outside the scope of the patent. Thus, although Apple's Accused '490 Products with Intel baseband chipsets and the previous software do not infringe, products implementing the software change (included in iOS versions 12.1 and later) leave no doubt on that score." "[...] [L]ate in the hearing and in post-hearing briefing, Qualcomm and its Chief Technology Officer James Thompson began suggesting that design-around options were readily available, including specifically for the '490 patent. With regard to claim 31 of the '490 patent, Qualcomm argued that removing the accused functionality would be 'relatively simple' [...] and that Apple and Intel could avoid any infringement of claim 31 by 'simply remov[ing]' the accused uplink (UL) / downlink (DL) synchronization feature in response to an exclusion order." "[...] This fall, after the close of the hearing record, Apple implemented a new software-based design for its Accused '490 Products that removed the accused UL/DL synchronization feature that Qualcomm emphasized could be 'simply remove[d]' to avoid infringement of the '490 patent. To be clear, the pre-change versions also do not infringe the '490 patent, and thus there is no legal need to 'design around' it. But to moot any possible allegation of infringement from Qualcomm, Apple changed its products to do precisely what Qualcomm’s own witnesses testified would not infringe the '490 patent." Apple asks the ITC for six months just so there's enough time for an official determination of non-infringement in all iOS versions since 12.1. Otherwise there would be a risk of customs officers mistakenly seizing non-infringing iPhones at the border. There's no way that Qualcomm could credibly dispute Apple's workaround theory: Qualcomm's own CTO blessed this approach beforehand. Now it's too late. No government agency or judge is going to be persuaded by an after-the-fact about-face on Qualcomm's part. The workaround is in place, so even if Qualcomm obtained an import ban, it would be absolutely ineffectual. 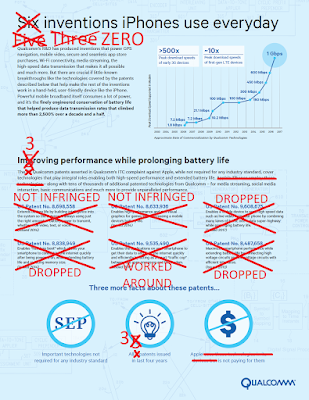 Qualcomm dropped three of the six patents before the evidentiary hearing (the ITC equivalent of a trial). That's actually quite normal: the ITC expects complainants to narrow their case. But the idea is that complainants focus on strong patents, and the three that Qualcomm chose to continue to assert were anything but strong. The ALJ held that two of them weren't infringed, and the Commission (the six-member decision-making body at the top of the ITC) affirmed those findings by denying a Qualcomm petition for a review. Instead, the Commission granted Apple's petition for a review of the finding of a violation of the '490 patent. But even if the final ruling upheld the ALJ's finding of a violation, and if the Commission then ordered an import ban against ALJ Pender's recommendation, Qualcomm would still have lost the case for all practical intents and purposes. An import ban against products Apple isn't even importing anymore before the final ruling comes down is worthless.